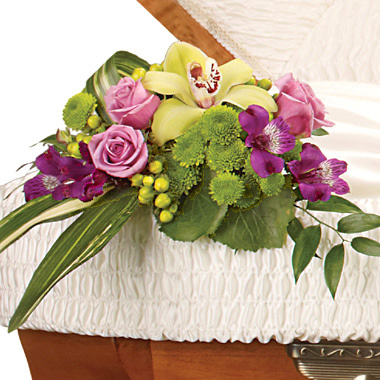 Add a special symbol of love from the children, grandchildren, or other family members with this stunning casket accent featuring a cymbidium orchid, roses, alstroemeria, button poms, hypericum, or similar fresh flower favorites, with stylish tropical foliage, too. Appropriate for the family. Approximately 14 to 16 inches in width.